Unit B – 991 Sq.Ft. 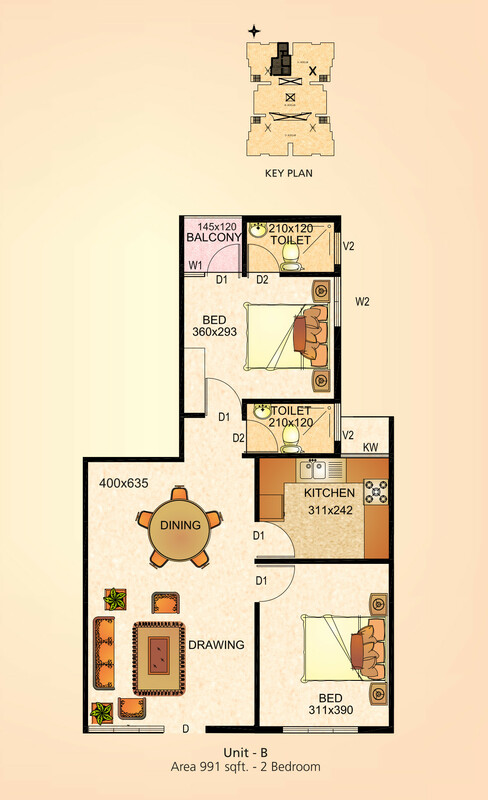 Unit Type: 2 BHK | Area: 991 Sq. Ft.
RCC Pile foundation, RCC Frame structure, walls of superior quality hollow bricks. Front Door : Teak wood shutter with polish finish. Other Doors: Hard wood frames and shutters with enamel paint. Toilet Doors : PVC doors. Aluminium window frames with security grills and glass paneling. Vitrified Tile flooring for the entire area except kitchen and toilet. Putty and emulsion paint finish for Internal walls. Cooking platform will be Black polished granite slab with stainless steel sink and 60 cm high designer glazed tiles for walls above cooking platform and light coloured ceramic tiles for floor. Sanitary ware concealed, plumbing with ISI certified PVC pipe, Standard make EWC and wash basin. C.P. Fittings : Standard quality fittings, provision for Geyser for master bedroom toilet, Quality designer tiles for walls up to 6 feet and anti-skid ceramic tiles for floor. Overhead storage tank for water supply. ISI Standard Havell’s, L&T or equivalent copper wires, Concealed switch boards, modular switches in drawing room, plate switches for other places controlled by ELCB and MCBs. Cable TV and telephone points in drawing and master bedroom. AC provision in master bedroom. Extra facility can be provided after studying the feasibility to individual choice at extra cost. Combined Units G & H – 2030 Sq.Ft. Combined Units E & F – 2030 Sq.Ft. Unit A – 1474 Sq.Ft. Unit D – 1474 Sq.Ft. Unit E – 1133 Sq.Ft. Unit H – 1133 Sq.Ft. Unit K – 1212 Sq.Ft. Unit L – 1212 Sq.Ft. Unit C – 991 Sq.Ft. Unit F – 920 Sq.Ft. Unit M – 1260 Sq.Ft. Unit J – 1260 Sq.Ft. Unit G – 920 Sq.Ft. Shire Homes is a name, which has made its presence felt in the residential and commercial infrastructure industry. Started by pioneers from various industries, they have a collective experience of 130 years. In business, experience counts.